The Productivity Project highlights tips and tricks tested by Chris Bailey during his year long experiment. Chris tested various methods of increasing productivity from committing to meditate 35 hours a week to working shorter days, each of Chris' attempts to increase his productivity brought to light a new learning.The book elaborates on each of these methods leaving tips that both embrace the digital age and lead readers down a more conservative path. He also examines meditation and nutrition as factors that can can impact your productivity. I quite enjoyed the way this book was laid out. At the beginning of each chapter, the reader is given the major points they are going to takeaway from the chapter and the approximate amount of time it is going to take to read it. This helped set expectations right from the get go. The author also includes mini assignments and tasks to reinforce his points and help the reader practice the skills they have just read/learned. Chris focuses heavily on the impacts that mediation has on your ability to focus. This was definitely a tip I took to almost immediately. I often use the time on my daily train commute (not always the best environment to try and find quiet) to meditate as it's normally the only time I have to myself. Since starting the mediation, I have noticed that my mind is less cluttered and I'm more prepared to start my mornings than I was in the past. The second nugget I took away from this book were the coffee consumption tips. I am a 3-4 cup a day coffee drinker. The Productivity Project emphasizes that timing your caffeine intake is important to both your productivity and your ability to sleep at night. I've since changed the way I consume coffee and I do admit I'm feeling less tired in the late afternoons. I supplemented what I learned in the book with the following tips I found on Chris' website about getting the most out of your caffeine intake. Drink coffee/tea over an longer period of time. If you drink a coffee in the morning, drink water alongside it. Stay away from sugary energy drinks. Eat very well if you consume caffeine. Don’t drink caffeine on an empty stomach. You can read the full article here. Only time will tell whether my new found coffee routine will help me be more productive. My wallet is definitely thanking me for it. I wish there was more that I could've taken from this book, but the above is a great start. There were many other tips related to reducing the amount of times you check your email and turning off notifications on your phone which I wish I could start doing immediately. Unfortunately, my job relies heavily on both, so it may take some time before I get to reap those benefits. But, with what I've read and tried so far, I think I'm on the right path to become a Productivity Ninja. 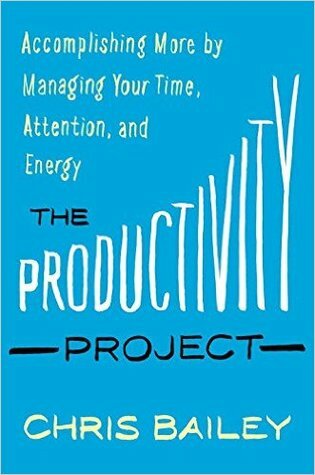 Disclaimer: I received an advanced copy of The Productivity Project from Penguin Random House of Canada. All opinions are my own.